DB Regio with its distinctive red rolling stock pitches into the busy Berlin to Hamburg market from 14 April 2014 (photo © hidden europe). All current direct services between Berlin and Hamburg are essentially long-distance services. Most of the trains on this prime business route are DB’s top-of-the-range smart, silver ICEs. 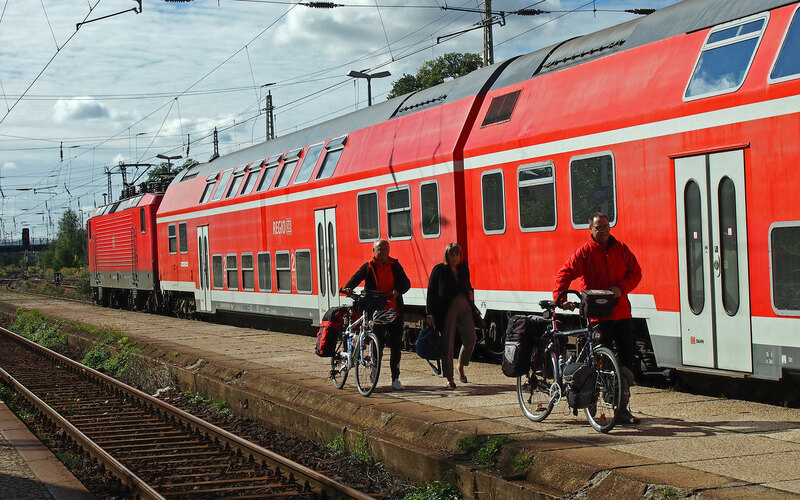 The others are InterCity or EuroCity trains, and travellers who don’t fancy riding in a run-of-the-mill German service will find Hungarian, Austrian, Czech and Polish carriages on selected trains between the two cities. In a word, lots of choice. But now DB Regio pitches into the same market. On Monday 14 April, DB Regio will start a once-daily (out and back) Interregio Express from the German capital to the Hansestadt. It will run early each morning from Berlin to Hamburg, leaving the German capital just before 7 am. The return run from Hamburg Hauptbahnhof to Berlin is at 4.36 pm on weekdays, but a little later - just after 6 pm - on Saturdays and Sundays. The route that the train will take is very unusual. It will not follow the main line (shown in Table 840 of the European Rail Timetable), but will instead run via Stendal, Salzwedel, Uelzen and Lüneburg. The only current Berlin to Hamburg direct trains using this route are the six-times-weekly EC248 (the Wawel from Wroclaw to Hamburg via Berlin) and a sole InterCity train - the Sunday evening IC1938 which dawdles from Berlin Südkreuz to Hamburg Altona via Stendal and Uelzen. It is a shadow in the modern timetables of a train that was once run mainly for troops returning to their barracks after a weekend at home in Berlin. This train is so slow that we can only assume that the German Army is never in any great rush to get anywhere. The only Berlin-bound long-distance services using this route are the Poland-bound EC249 Wawel (six times each week) and the Fridays-only IC1931 which, like its Sunday counterpart in the reverse direction, was slipped into the timetables with weekend home-breaks for soldiers in mind. The new Interregio Express (IRE for short) will appeal to budget-conscious travellers who do not mind that their journey takes a little longer. The run on the IRE from Berlin to Hamburg will take about three hours. By way of comparison with existing options, the fastest ICEs speed between the two cities in about 1hr 40mins, with most IC and EC trains taking about half-an-hour longer. So the IRE’s selling point is clearly not speed. It is price. The fares on the IRE look very attractive: just €19.90 for a single journey or €29.90 for a return (valid for 15 days). There is no need to pre-book, but it might be no bad idea so to do, for this new service will surely pull the crowds. Very unusually, for a DB Regio train, it will be possible to make a seat reservation. Looking at the new service, we find that it interestingly blurs the distinction between regional and long-distance rail services — a distinction which Deutsche Bahn (DB) has generally cherished in recent years. With such low fares, the IRE could lead to revenue dilution as passengers with a little time on their hands shift from the fast ICEs to the slower but cheaper IRE service. But the market development specialists at DB possibly take another view. The growth in inter-city coach traffic in Germany in the past year has been remarkable. It has shown that Germans do not mind if their journey takes an extra hour if they can make a substantial saving in costs. DB’s market development strategy has until recently been all about speed. Investment in high-speed lines and faster trains have been deemed the keys to luring Germans out of their cars and onto trains. With the new IRE link between Germany’s two largest cities, we now see an emphasis on price competitiveness. It will surely appeal to travellers who might otherwise have taken the coach. Our view is that this is a new service well worth trying. It is a regional train with a twist — one that finds a parallel in some French trains that bridge the gap between TGV services and slower TER trains. Examples are the Interloire service between Orléans and Nantes and the Intervilles trains on the Marseille to Nice route. Quite apart from the Berlin — Hamburg low-cost market, the new IRE service certainly creates some attractive new day-trip possibilities. The timings allow easy out-and-back-in-a-day trips from Berlin to Lüneburg or Stendal to Hamburg. This is not the first attempt to introduce an IRE train from Berlin. In December 2010, DB Regio started twice-daily IRE services from Berlin to Magdeburg. With a special livery and bright interiors for the double-deck trains, this IRE service was certainly a cut above the normal DB Regio train. First-class passengers even had a complimentary at-seat beverage service. After just two years, the fast IRE from Berlin to Magdeburg service was scrapped for lack of custom. With the new Berlin to Hamburg link, the approach by DB Regio is very different. It recognises that price, rather than service level, may be the key to getting bums on seats - though still with the chance for travellers to buy a coffee or light snack along the way. We shall be interested to see how it works out. DB Regio will make a fuller announcement on its new Berlin to Hamburg service on Wednesday 19 March, when further details of timetable will be revealed. The online seat reservation and advance bookings will open a fortnight from today on Tuesday 1 April 2014. We understand that the service will not be available for local journeys between Uelzen and Hamburg and vice versa. We presume this is because DB Regio does not have any other services on the Uelzen - Lüneburg - Hamburg route. That railway is operated by independent operator Metronom (which is co-owned by three German States, who perhaps are none too keen about having DB Regio turning up on what they now regard as very much their territory).